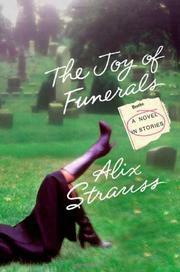 Novel-in-stories about morbidly lonely thirtysomething women who find comfort in mortuaries. The women here are bereft of men and angry about it. In the first, seemingly unconnected chapter, “Recovering Larry,” a widow of several weeks seeks to hold on to her husband by seducing men she finds at the cemetery and re-creating with them the matrimonial communion. In “Shrinking Away,” a shopaholic debtor and Upper West Side daughter, Helen, commits a final desperate cry for love by stealing the ashes of her lover-therapist, Marty, who stepped into an elevator shaft. These are savvy, well-educated people, mainly in New York City, born into wealth and fortune and yet lacking satisfying love-relationships. Their obsessive stalking of others to assuage their gnawing loneliness can border on the creepy: in “Versions of You,” Shannon, the fat girl in the Fifth Avenue office whom no one likes, fixates on the skinny, chronically hung-over Lilly and bestows on her a set of encyclopedias Shannon has bought from a dubious salesman type who reminds her of her father. “Addressing the Dead” pursues the sad affection a newly motherless daughter strikes up with her mother’s funereal cosmetologist; while “Post Dated” chronicles the mortifying moments of a doomed blind date—the man ends up murdered. Ultimately, each protagonist reappears in the title story (the last and longest). There, Nina Perlman, incognito, recounts her systematic, daily visits to funeral services in order to find connection and consolation with the grief-stricken relatives: “Will you love me?” she ponders while meeting these strangers, who either draw her in with gratitude or cast her out in repulsion. Newcomer Strauss achieves cohesion, but her writing snags on the lamentably pedestrian (“anxiety rising in her chest like a soufflé baking in the oven”), while her characters, similar in background and voice, begin to sound like one another. A snappy idea buried by verveless writing.